The Jane Addams Photo Album - photographs from people who lived in the Jane Addams Homes! 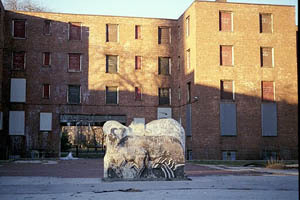 Donations: $110,000 is needed to restore the "Animal Court" sculptures. 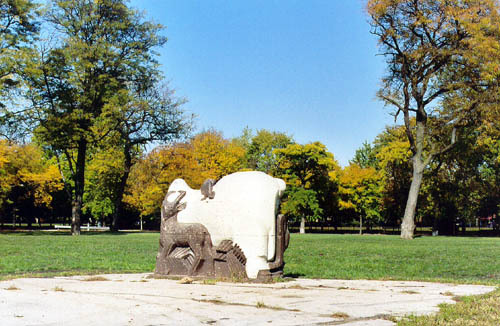 To make donations to restore the Edgar Miller Jane Addams Homes Animal Sculptures: Please make a check out to: "Roosevelt Square Community Partners Inc" with "Animal Sculptures" in the bottom left memo section. Please send your checks to: The Chicago Conservation Center, 730 N. Franklin #701, Chicago, IL 60610. Any contribution is tax-deductible. 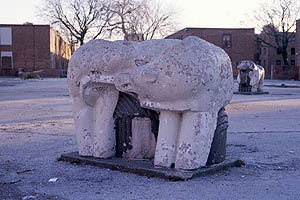 May 2007 - the sculptures have been moved from the Jane Addams site into storage, awaiting restoration! Photographs of the move courtesy of Joe Marinaro. In my quest to document and explore extant WPA/New Deal art, I was told that there are several statues at the Jane Addams house in Chicago which are in bad repair and needing "protection". Of course, being a linear-thinking person, I assumed that this referred to the Jane Addams Hull House on the University of Illinois-Chicago campus at 800 South Halsted Street, Chicago, IL. I visited Hull House with my brother, Bob, where we discovered that Hull House, germaine to the development of social work and many, if not most, of our social reform policies, had sponsored many WPA-funded art classes. Hull House had been "home" to Morris Topchevsky as well as other WPA artists. 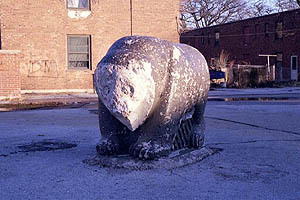 However, the elusive statues were not on the Hull House grounds. Bob and I found them at the Jane Addams Homes, an early public housing development constructed in 1938 and currently being razed by the Chicago Housing Authority. October 29, 2005 Update on the status of Animal Court at the end of this page!!! 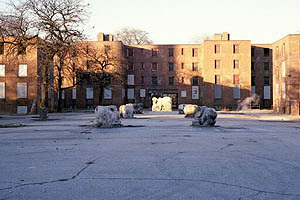 The Jane Addams Homes, located at Throop and Taylor, consisted of 32 buildings (987 walk-up units and 52 row houses). They are under the administration of the Chicago Housing Authority (CHA) and are grouped with the Robert Brooks Homes (built in 1943), Brooks Extension (built in 1961), Loomis Courts (built in 1950), Grace Abbott Homes (built in 1955), and Jones Apartments (built in 1963) under the name "ABLA Homes". The Jane Addams Homes are in the process of being either destroyed or restored by the CHA. 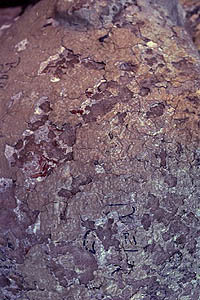 As you can see from the photos, the buildings, while very interesting from a historical point of view, are in bad repair. The statues share this condition. 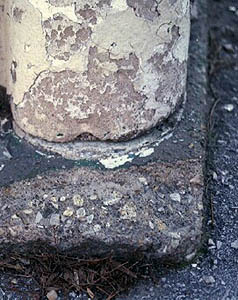 According to a local long-time resident, these statues began to deteriorate years ago. 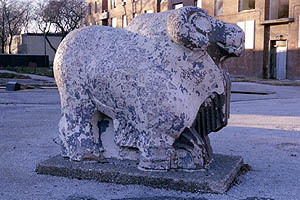 In order to preserve these limestone statues, an elderly man who lived in the Jane Addams Homes started painting them to improve their appearance. 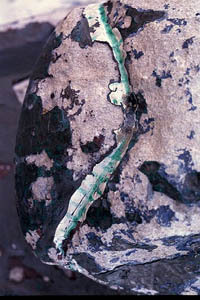 He continued to re-paint the statues for many years until he died. Since his passing, no one has tried to maintain these statues. Like their former caretaker, they are about to die if not rescued. Emannuel Viviano funded by the Illinois Art Project and Edgar Miller funded by TRAP. 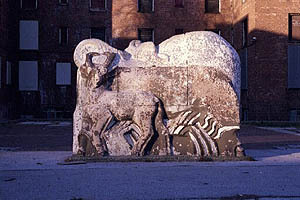 Both artists recorded "Animal Court" as the title of their work . The records list six statues attributed to Edgar Miller. 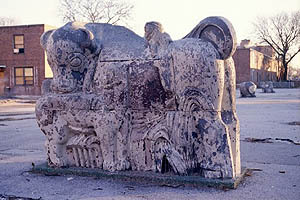 Since there are seven statues, one of a different size and style than the other six, one possible explanation is that both artists contributed to "Animal Court" with Viviano creating the design for the large center statue. 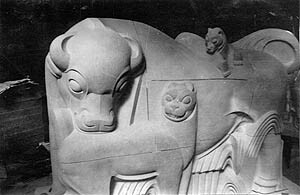 The art created through the WPA was often a collaborative effort. 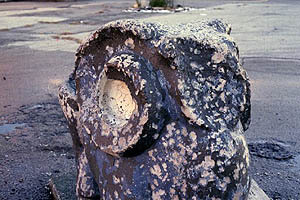 Although Viviano designed the large central sculpture, it was a local Chicago artist, Charles Bahl, who actually made it. 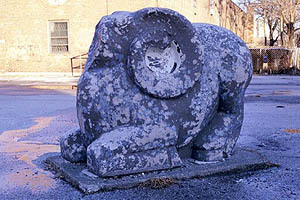 Charles Bahl, born March 4, 1897, owned Bahl Stonecutting Contractors located on Irving Park in Chicago. 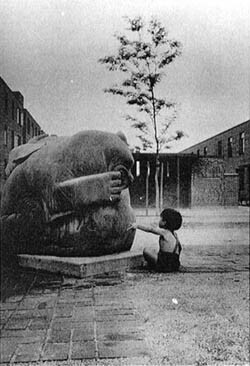 During the Depression, he was hired by the Federal government to create this sculpture. of this work of art. 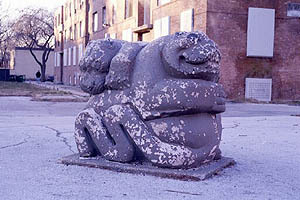 These sculptures were an integral part of the pleasure and excitement of living at the Jane Addams Homes. The following two photos are courtesy of the National Archives photo collection. Anyone interested in helping preserve these statues can contact Heather Becker (hbec@earthlink.net) at the Chicago Conservation Company. 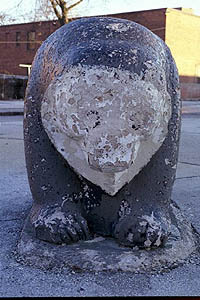 She is in the process of exploring funding possibilities for restoration of these statues. An interesting footnote to this artwork is that apparently several early Chicago housing projects were the recipients of WPA art. 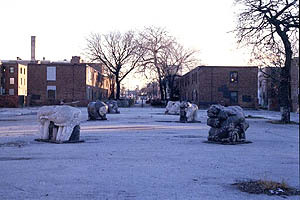 At the Trumbull Park Housing Project, 2400 E. 105th St, Chicago, two plaster sculptures by Alfred Lenzi were installed - "Mountain Lion" and "Wild Boar." 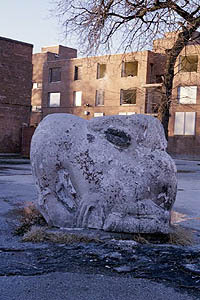 At the Julia Lathrop Housing Project on the northwest side of Chicago (located along the Chicago River, west of Clybourn and Damen, north and south of Diversey), five sculptures were placed: "Elephant" by Juliana Morgan; and "Camel," "Cow," "Horse," and "Llama," all by Charles Umlauf. 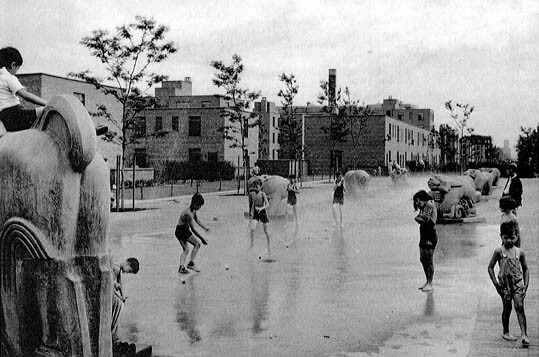 If you are interested in background information about early Chicago housing projects, check out the site: http://www.public.asu.edu/~wplotkin/DeedsWeb/wells.html. ("In March, 1936, construction was begun on the Julia Lathrop and Trumbull Park Homes and on the Jane Addams Houses in December, 1935. Construction on the Ida B. Wells project was started August 25, 1939, four years after the Jane Addams and three years after the other two. Yet on October 28, 1934, condemnation proceedings for the Ida B. Wells project were filed--and later withdrawn." On October 29, 2005, I visited the Animal Court again to find that most of the building have been razed. 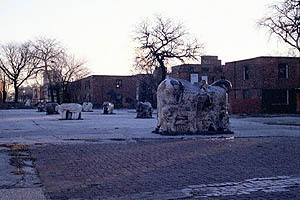 Now instead of a wall of public housing, an open grassy park frames the statues. Compare the background of the 2005 photo with the one taken in 2003. 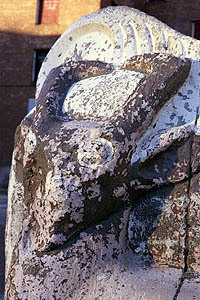 The central figure in this recent photo is the statue in the 2003 photo immediately above it. As you can see, the buildings have all been razed.